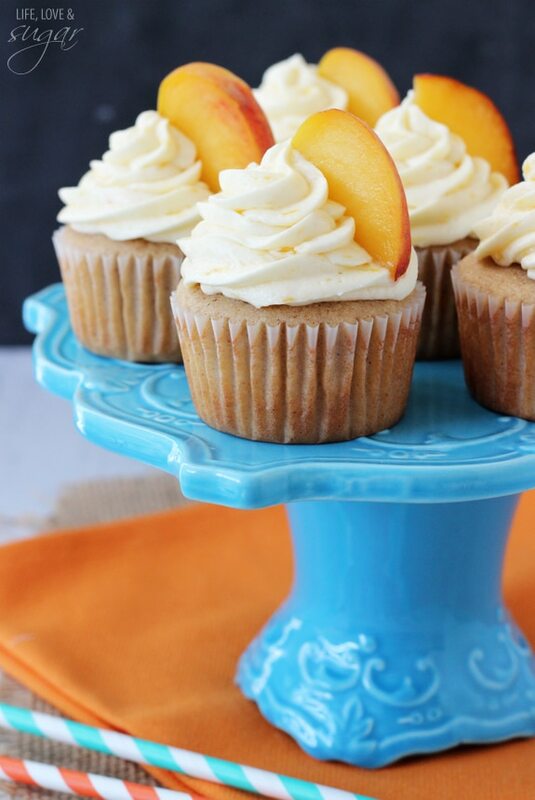 These Peach Pie Cupcakes are all my favorite elements of peach pie rolled into a cupcake – cinnamon, sugar and of course, peaches. They’re moist, fluffy and will be your new favorite summertime cupcake! So do you remember the Thick and Chewy Chocolate Chip Cookies I posted last week? And how the hubs wasn’t going to stop pestering me until I made him more? Well I finally did at the end of last week and he was thrilled. A little later he went to go get another cookie and saw that I’d eaten one. He was not happy. Apparently, if I want cookies, I have to make my own because those are his. I’m sorry, did I make those? Doesn’t that make them mine and I’m just kindly sharing. 😉 He’s such a nut. And big cookie guy. He didn’t actually get around to tasting these Peach Pie Cupcakes because they were made the same week as the cookies and I couldn’t catch his attention long enough to shove one in his mouth. One of my other regular taste testers did taste them though. And he declared them to be his favorite cupcake so far. To be fair, he’s a big peach guy. Peach fuzz and all. They are delicious though. 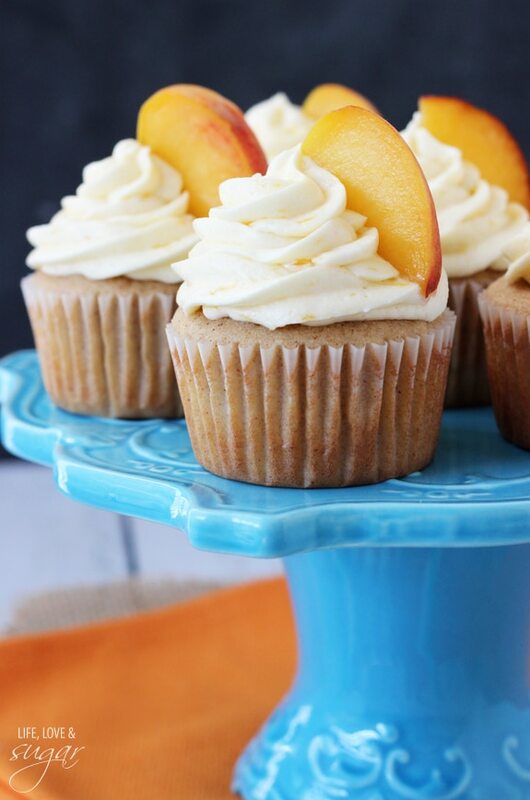 The icing is pure peach heaven and gives the cupcakes most of the peach flavor. There are chunks of peach in the cupcakes as well, but the icing is where it’s at. One note about making the icing. Peaches are more or less liquid-y depending on how ripe they are. More ripe = more liquid. So when making the icing, start with about 5 tbsp of peach puree and then add more from there until you get the right flavor and consistency. If your peaches are more ripe, you probably won’t want to use as much puree if you want a thicker icing. However, if you find you’ve added too much puree, you can always thicken it back up with more powdered sugar. Icing is forgiving like that. It’s one of it’s many great qualities. 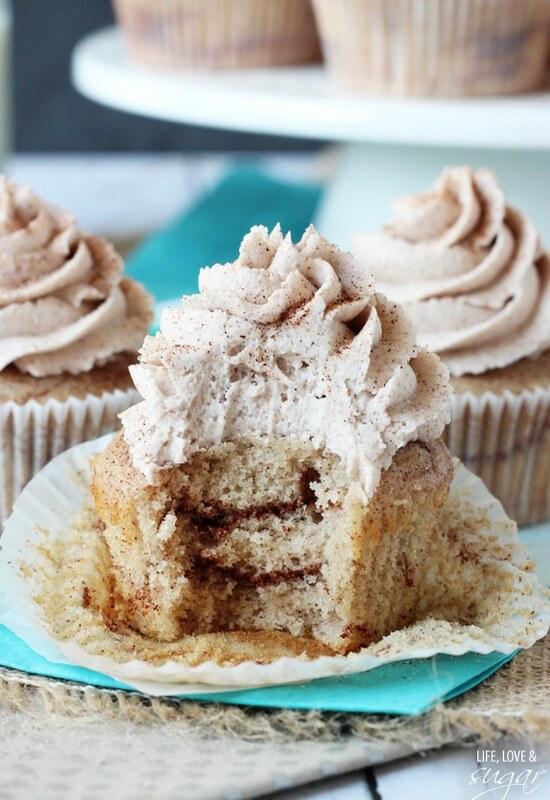 The cupcake is full of cinnamon – the most important flavor next to the peaches in a peach pie. You must have plenty of cinnamon. Yum! And as with all cupcakes, make sure not to overcook them. Check them at 17 or 18 minutes and give them more time if needed. A toothpick inserted should come out with a few crumbs when they are done. These cupcakes would be perfect for anytime, but also the upcoming July 4th holiday. Next to apple pie, I’d say peach pie is pretty American. So why not celebrate with a cupcake version! 2. Whisk together flour, sugars, cinnamon, baking soda and baking powder in a large mixing bowl. 8. To make the icing, beat the shortening and butter until smooth. 10. Mix in 5 tbsp of peach puree. 11. Add the rest of the powdered sugar and mix until smooth. 12. Add more peach puree to get the right consistency and flavor. The more puree added, the thinner the icing will be. If it gets too thin, add more powdered sugar. 13. Ice cupcakes and top with peach slices if desired. For the cupcakes and icing, only 3-4 peaches should be needed. 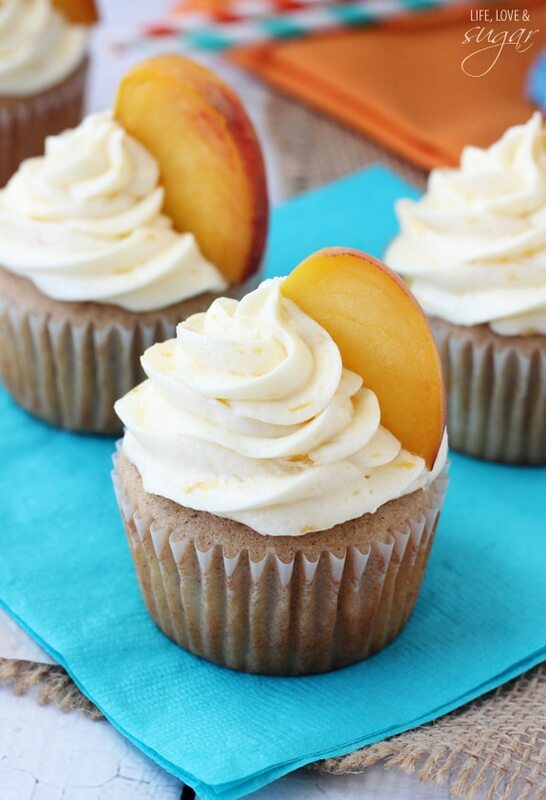 More will be needed if you want to top the cupcakes with peach slices. Note: For the cupcakes and icing, only 3-4 peaches should be needed. 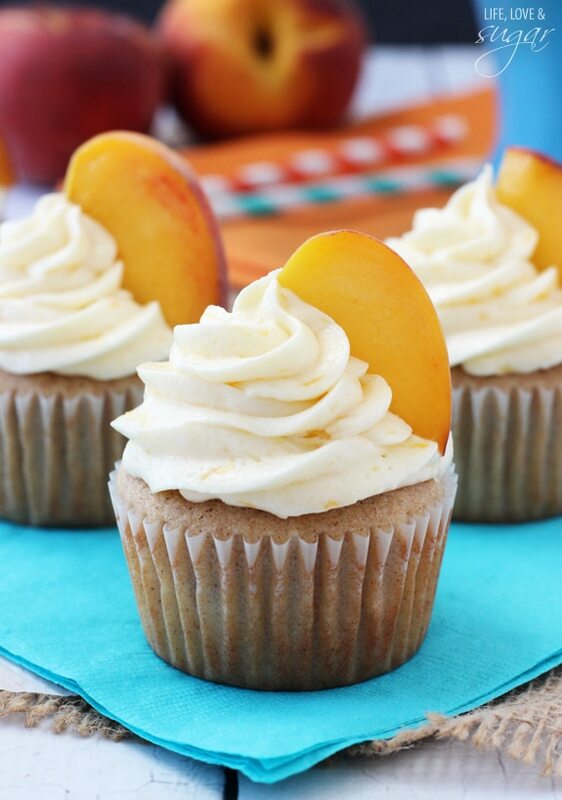 More will be needed if you want to top the cupcakes with peach slices. These cupcakes sound absolutely delicious! I love peach pie – so fresh, and you’re right, so American. perfect for this weekend. The deliciousness of a pie in an easier cupcake form? Yes, please! These look absolutely delicious! 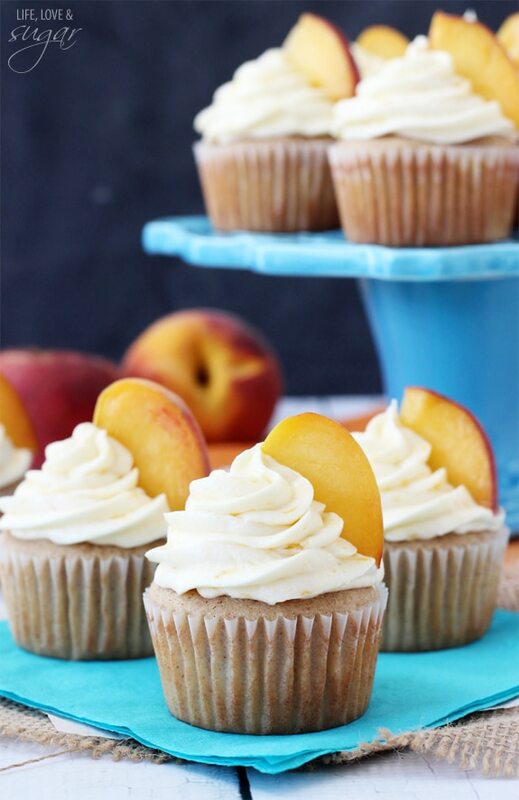 Three of my favourite things combined: peaches, cinnamon and cupcakes – I can’t wait to try out this recipe, my mouth is watering already. Pinning this for future reference! Thanks Emma! And thanks for the pin! Peach Pie is definitely high on the list of “All American”. 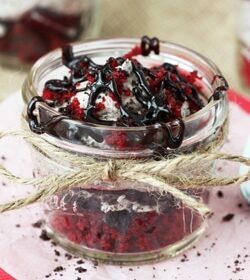 Turn it into a cupcake, and I think it moved up the list a little more! These sound delicious. And I have to say, your photos are all so pretty, and so are all your cake stands. I love looking at them! Thanks so much Julia! I get most of my cake stands at Home Goods, including this blue one. WOW. These look so incredible!!! My husband is a cookie guy, too! Oh well. The guys are missing out! These are incredible! 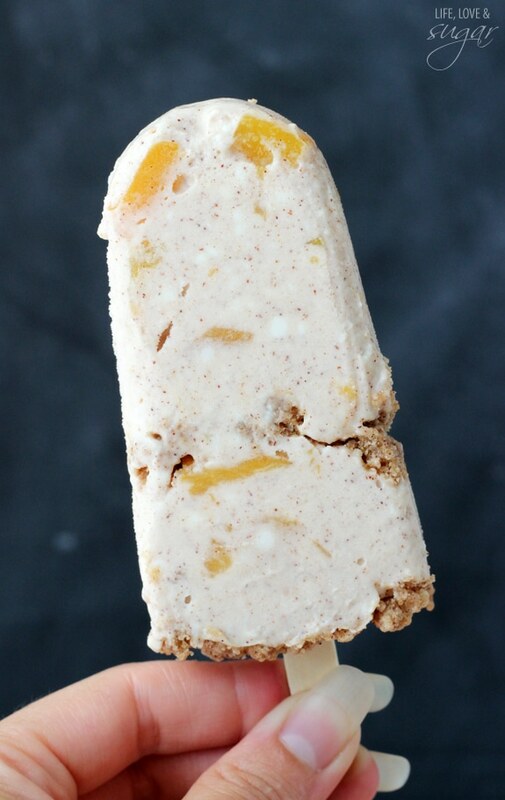 Can I use frozen or canned peaches in this recipe, or fresh peaches is a must. Also, how do you make peach puree. I would recommend fresh peaches in this case. If you try the canned or frozen peaches, you’ll want to make sure to wash them off and let them dry before using them. The added moisture could affect the way the cupcake bakes. I also mentioned in the post that more liquid in the peaches can affect the icing as well, so check that out. To make peach puree, just put peaches in a blender or food processor and puree until most of the chunks are smooth. WOW these are so gorgeous!! See I love pie but hate making it, so making a peach pie CUPCAKE is freakin’ brilliant! All the fun flavor of pie without any of the stress. 😀 Count me in! I have been trying to get over here to comment on this for like a week! I am so in love!!! 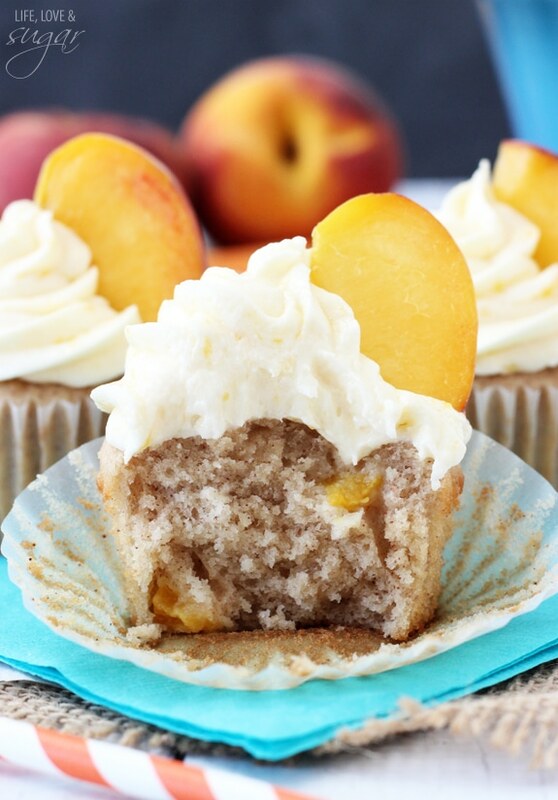 Peach pie cupcakes=total awesomesauce!! And seriously, they are bakery shop worthy! 🙂 So pretty! Lindsey: when I mentioned in your post with the Neapolitan cake about taking forever. The story is I made your Peach Pie Cupcakes, it took me 3 days to get them finished. You see I had this back surgery in Jan.14 & I am doing great but the things like I always fixed such as baking are going to have to wait until I am a lot stronger. But your cupcakes tasted great, even though I didn’t ice them. I would have if I had been taking them to a covered dish event. Thanks for all the good recipes you post, & the Bible verses & your testimony. I am about to try making these – they look delicious – but was wondering if the butter in the cupcake recipe is salted or unsalted. Can you actually taste the peach flavor in these cupcakes, sometimes when you bake with fruit the flavor gets lost in the baked good. 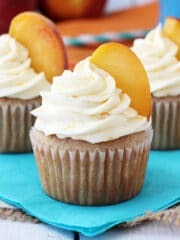 Yes, there’s a fair amount of peaches in the cupcakes, so the bites with the peaches have the most peach flavor. The icing also packs a lot of peach flavor. Can you use all butter in the frosting recipe. What a killer recipe! I want a dozen! 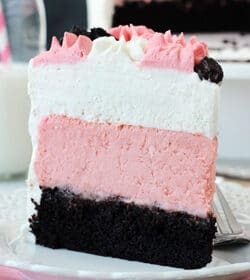 Can this be made in a 9 x 13 inch cake pan? I haven’t tried it so it’s hard to say. You’d probably want to double the recipe though if you try it. Hi I have a quick question. 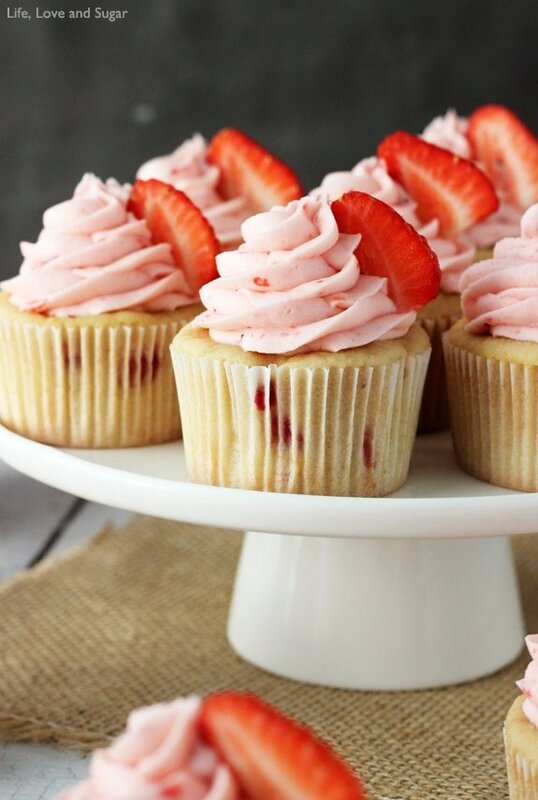 I have made your fresh strawberry cupcakes delish I must say so as I was reading over this recipe for the peach pie cupcakes I noticed the milk and sour cream measurements are switched from the ones in the strawberry cupcakes. I just wanted to make sure I do switch them. Thanks and I love your recipes!!! They are a hit with my family and friends also!!!! Gosh, it’s been a while since I made them both, but I do believe it’s correct. The two fruits have different amounts of moisture in them and I remember playing around with them both to get them right, so it should be correct as written. I’m glad you’ve enjoyed the recipes! Thanks Renee! Hi! Made this recipe today and they were scrumptious!!! The cupcakes didn’t rise as I thought should. I double checked my ingredients. I swapped plain Greek yogurt for sour cream and I baked them in silicone cupcake pans. I did use peaches I canned last summer, but drained them before stirring them in! Thanks!! Hi there. 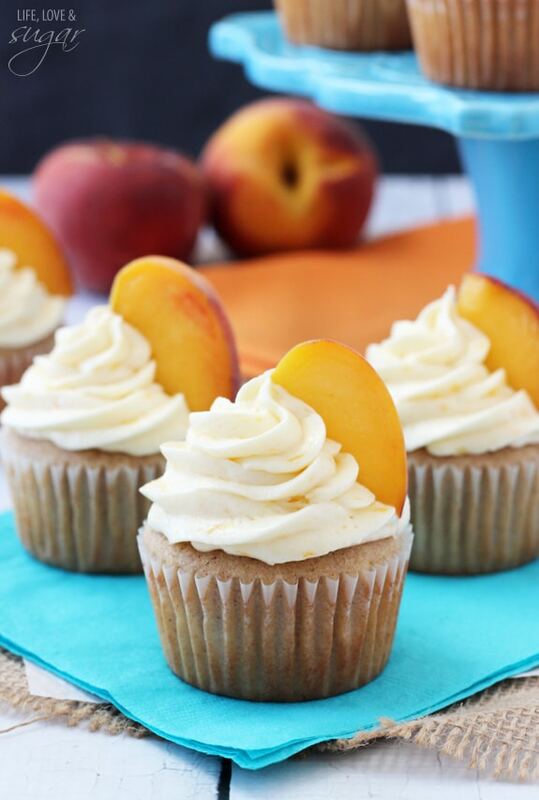 I really want to try this recipe for an upcoming event – do I need to blanche and/or peel the peaches before mixing them into the cupcake and into a puree? These sound so good and I’m looking forward to trying them out! Yes, you’ll want to peel them first. I hope you enjoy them!